What must learners of mathematics possess so that they can learn mathematics on their own? For example, once a student graduates from my college, what does she need to continue learning mathematics on her own? Besides having some body mathematical content knowledge, this student would probably need to have some mathematical habits of mind, some productive dispositions about learning mathematics, a sense of self-efficacy, a growth mindset about learning mathematics, perseverance, etc. So, now let’s ask an analogous question: say we are trying to help teachers (of all levels, primary, secondary, tertiary) learn how to teach in more equitable and inclusive ways. What must they possess to do that? They might need to know some instructional strategies for equitable and inclusive teaching, but clearly they need more than that. Why is it, then, that most professional development is focused on helping teachers acquire instructional strategies, but not much more than that? It would be as silly as if we only focused on helping students acquire content knowledge in our fields and none of the other things that they might need to continue their own learning. To all of you who think deeply about equity and justice in education and are looking for ways to help teachers teach in more equitable and inclusive ways, here’s an important question: What must teachers possess to continue making their classrooms more equitable and inclusive long after they have left our workshops or training sessions? Clearly they need some of the “whats” and “hows” of equitable and inclusive teaching–they need to learn some equitable instructional strategies. 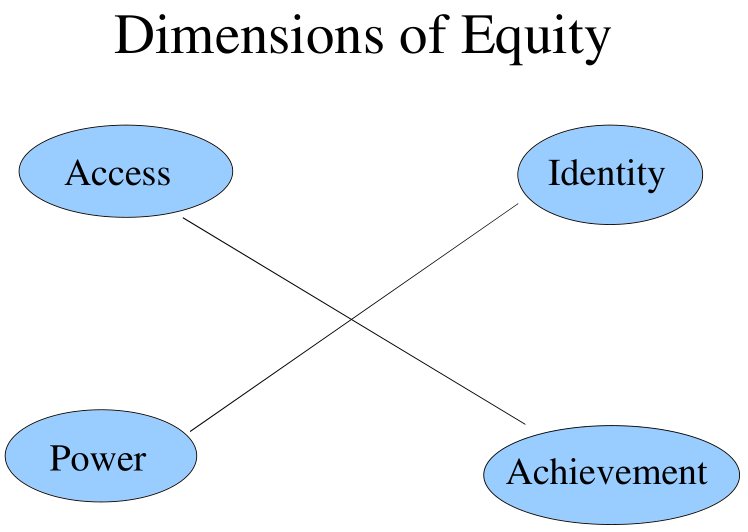 Pick your favorite ones: using “equity sticks” to call on students more equitably, finding ways to remove gendered language and examples from your course content, active learning strategies (like inquiry-based learning, POGIL, etc. ), justice-oriented curricular materials, etc. Those things are important, but what else? With input from Sumun Pendakur and Peg Cagle, I’ve compiled this list of things that teachers need to continue making their classrooms more equitable and inclusive. Will you help me edit/add to this list? A Sense of Purpose: What’s the force that compels me to do more and grow? It could come from a personal moral and ethical stance, spiritual practice, determination to make the world better for future generations, or affinity with your institution’s mission, etc. (b) Asking not just about the “whats” and “hows” of teaching, but also the “whens” and the “whys”; having an understanding that classrooms and people are too complex to boil things things down to “best practices” and instead being able to think of the classroom as an ecology of people, environments, and their relationships with each other. (c) Having a habit of self-reflection about one’s teaching practice. Community: Participation in a community with other professionals who are struggling through similar problems of practice helps me continue to grow. But it’s not just having folks around, but also knowing how to engage in effective professional conversations. Julianne Vega recommends the book Talk About Teaching! Leading Professional Conversations by Charlotte Danielson. Joy and Humor: This kind of work is too difficult to sustain without self-care. The ability to find joy in your work and to take work seriously, but not take yourself too seriously, helps us pick ourselves up when we make mistakes and continue learning. I also highly recommend the “Killjoy Survival Kit” in Living a Feminist Life by Sara Ahmed. There is a great deal of overlap here between things one might need to improve as a teacher in general and things one might need to teach in more equitable and inclusive ways. Items #4 and #6a above seem to me to be specific to teaching in more equitable and inclusive ways. What else is missing from this list? And the big question, of course, is: how do we cultivate these things in ourselves and help others cultivate them too? I’ve written several posts (1, 2, 3) about why active learning is a good thing. There is even growing evidence that some forms of active learning seem to raise student learning outcomes and make those outcomes more equitable at the same time. All of that is great, but I believe strongly that active learning is not a magic bullet and can be implemented well or poorly. It can sometimes alienate students. A few years ago, I asked students to work in groups on a set of problems in complex analysis. I didn’t give any instructions on how to work well with each other and the problems were rather routine ones. That created a situation in which a student felt left behind in her group and she got discouraged. I tried to talk to her after class but it didn’t help and she dropped the class shortly after. She said that she dropped the class because it didn’t fit into her schedule, but I still suspect that the group work experience had something to do with it. In this post, I would like to argue that just using active learning is not enough. Because active learning requires students to be more engaged in their own learning and often involves more human-to-human interactions, we must pay attention to how those experiences support or diminish students’ sense of competence and belonging. I believe that in most cases, what’s needed is a little more care and planning in the use of active learning. I’ll try to illustrate that through some examples. A common active learning strategy is “think-pair-share“. Unfortunately, I often find that instructors skip the “think” step and skip to “pair and share.” And more generally, I find that most speakers/facilitators/instructors don’t give any (or sufficient) independent think time before asking participants/students to talk with one another. In many situations, independent think time is so important because it gives time for people who process information in different ways to put together their thoughts before talking. Some people are great at “talking while thinking”: putting together their ideas while talking it out. It can work out well if you’re like this and you’re around other people who are similar–the process of building off of each others’ ideas mid-sentence is fun to watch. Unfortunately, I’m not one of those people. I prefer to have some time to think before I just start talking and I don’t like it when other people interrupt me when I’m talking. By giving students independent think time before asking them to discuss, instructors can give students more equitable access to the opportunity to think. Students with learning differences, students whose first language is not English, students who are introverted will appreciate having more time to think before speaking. Even those students who like to “talk while thinking” will probably have more refined ideas to share before they start talking. Therefore, the independent think time makes discussions far more productive and less awkward. I dislike those moments when I’m in a room of people and the speaker/instructor asks us to talk to each other and there’s this awkward period when people are trying to figure out what to say and who should start, etc. Do you assign open-ended projects in your classes? For example, in our introductory differential equations course, we often ask students create a model involving differential equations for some phenomena in their lives, then give a short presentation on it. It’s an assignment that spans several weeks and involves teams of three students working together. These kinds of open-ended projects have all sorts of wonderful benefits: increased agency allows students to take more ownership over their learning; the open-ended nature of the task allow them to connect the course content with their own lived experiences; the chance to be creative makes the learning more memorable, fun, and motivating. However, it is important to look at how these open-ended projects are structured for students. In particular, I am thinking of the work by Mary-Ann Winkelmes and others on the Transparency in Teaching and Learning (TILT) Project. If our instructions for these kinds of assignments don’t clearly convey to students why they should be personally invested, how to carry out the work, and how the work will be evaluated, we run the risk of making students bewildered and discouraged. That’s where it becomes helpful to be transparent about the purpose, tasks, and criteria for these open-ended projects. Of course, the tricky part is to balance being clear about processes and criteria while still maintaining high cognitive demand and room for creativity. The reason this issue connects with equity is that not all students have had the benefit of having similar kinds of experiences in their previous education. Those that have often run with these kinds of open-ended tasks. Those that haven’t are likely to find the task so open-ended to be unsettling. Here’s a nice way to see if your open-ended projects are written up in a way that students might find confusing: show your project instructions to a colleague in a different content area. Ask them what questions they might have as they read the instructions for your open-ended project. That will help to reveal some of the hidden assumptions that you might be making about what students know about these kinds of tasks. Being more transparent helps to put students on a more level playing field. I saved this topic for last because I think it’s tricky to do well. The rewards and risks that accompany it are great. If you assign students to work in heterogeneous ability groups (i.e., creating groups in which struggling students work with “more capable” students), there is always the risk of the groupings themselves to discourage students. Students aren’t dumb–they know that we sometimes group them in this way. If you are struggling in the class and you see that you’re always the one in the group that is struggling, and you’re not really getting the support you need from your peers, you might begin to wonder whether you really belong in the group and the class. Students also don’t know how to help each other, especially in math classes–their understanding of what it means to help someone else usually involves telling someone a procedure or answer without providing any of the rationale. But even if you group students in other ways, because you can’t be in all places at all times in the classroom, there is always the risk that one of your groups has negative interactions that spoil the learning for the group, or worse, cause some students to feel marginalized or excluded. The example that I mentioned at the top of the post suggests a second reason why group work can go badly. When you ask students to work together on a task that really doesn’t require multiple brains, then you’re setting students up for to compare themselves with each other to see who can do it faster/better, or to zone out and copy the work of the “smart” student. If you’re going to have groups of students work together, then the task should really take advantage of the fact that multiple brains working together can accomplish more than those brains working in parallel but separately. In other words, you should use group worthy tasks. Third, group work can go awry because we all have biases. The small groups in the classroom become microcosms of inequities that exist in the broader society. For example, if you have a group of three men and one woman working together, you might find that the three men ignore the contributions of the woman. Students need to learn how to work well with each other. Scan the classroom frequently for status issues (for example, by looking at each student’s body language and how much they are talking/contributing). Finally, there is the challenge of establish and maintaining norms and expectations for group work (you have them, right?). If students aren’t familiar with your norms and expectations, you might want to find ways for students to practice working in groups before doing it in class on course content. What other strategies do you use to ensure that active learning in your classroom supports the learning for all students? Please add your comments below.